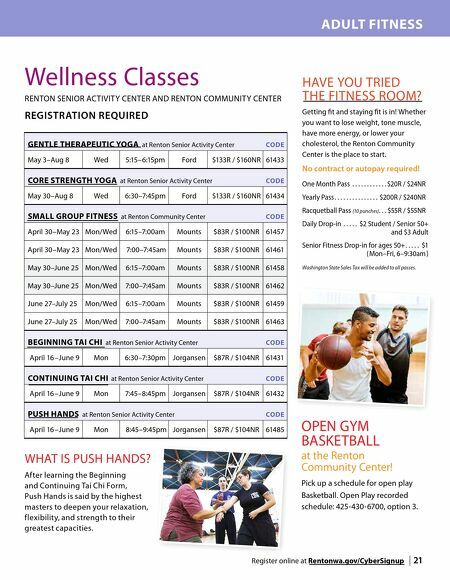 20 | Register online at Rentonwa.gov/CyberSignup ADULT FITNESS FITNESS CLASS PUNCHCARDS Save money from daily drop-in fee for $10R/12NR or purchase a punch card and get 12 visits for $84R / $96NR A GRE AT VALUE! Cards valid for six months. M O N DAYS T I M E I N S T R U C T O R Boot Camp 5:30–6:30pm Linda T U E S DAYS T I M E I N S T R U C T O R Cardio X-Training 4 X 15 Format 9:00–10:00am Linda W E D N E S DAYS T I M E I N S T R U C T O R Boot Camp 5:30–6:30pm Linda T H U R S DAYS T I M E I N S T R U C T O R Cardio X-Training 4 X 15 Format 9:00–10:00am Linda Drop-in Fitness Classes AT THE RENTON COMMUNITY CENTER TRY SOMETHING NEW! All fitness classes are for ages 16 and up GET SWINGIN'! Racquetball is one of the many sports that can be played in all seasons, including winter! Our courts may be reserved in advance, only $7 an hour to rent. We provide the racquet, ball and eyewear if you don't have your own. Challenge yourself and sign up for our Adult Co-ed Racquetball League, for all levels of play! See page 19. 5K Saturday Runs Looking to for a way to enhance your workout and meet people with common interests? Check this out! 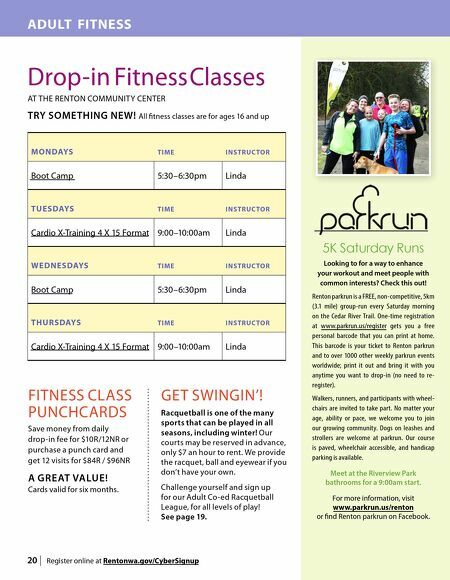 Renton parkrun is a FREE, non-competitive, 5km (3.1 mile) group-run every Saturday morning on the Cedar River Trail. One-time registration at www.parkrun.us/register gets you a free personal barcode that you can print at home. This barcode is your ticket to Renton parkrun and to over 1000 other weekly parkrun events worldwide; print it out and bring it with you anytime you want to drop-in (no need to re- register). Walkers, runners, and participants with wheel - chairs are invited to take part. No matter your age, ability or pace, we welcome you to join our growing community. Dogs on leashes and strollers are welcome at parkrun. Our course is paved, wheelchair accessible, and handicap parking is available. Meet at the Riverview Park bathrooms for a 9:00am start. For more information, visit www.parkrun.us/renton or find Renton parkrun on Facebook.